I am what is known as a prayer warrior--someone who prays, a lot, for a lot of different people and a lot of different circumstances. I am also what is known as a control freak. Okay freak might be too strong of a word, but a person who favors having control over situations. What do these two have in common? Well, I have reluctantly learned over the years that, believe it or not, I cannot control many situations (not that I don't try). But, thankfully I have also learned that I can control my worries and fears about those situations through prayer. Praying gives me a sense of doing something about a situation in which there is nothing I can do. Now, I know darn well God is the One doing the doing, but talking to Him about it, letting Him know how I feel about it and then trusting (or at least trying to) that He will work it all out for good brings me peace. And I have been praying a lot lately, as circumstances around my husband's health have felt out of control. To make a long story short, last March my husband was diagnosed with Celiac's Disease. This was a welcomed diagnosis, after seven years of symptoms, and much preferred to the cancer word they kept throwing around. Then he started having back issues, which many of you have prayed for, but unfortunately are still not resolved--he meets with a surgeon on Tuesday. In addition, he has tested positive for ANA titer, which means they think he has another autoimmune disease, on top of Celiacs. His thyroid is messed up from the Celiacs and they can't get those numbers right. He will meet with a specialist across the state on January 24th. This has all been so hard on my very active, athletic, never met a sport he didn't like or couldn't excel at husband. And so I pray, for his spirits and back, and bloodwork, and health, and my sanity. And yes, I covet your prayers. Also please know, that if I ever tell you I am praying for you, I am, and I don't take that lightly. Thanks for "listening" and praying. PS--I hope you don't tire of me showing Montana off. 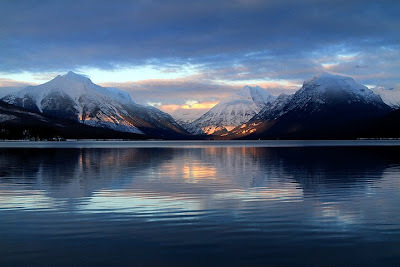 This picture is of Lake Mcdonald in Glacier--I worked there for 2 summers in college. I am also someone who prays a lot about a lot of different things. I will be praying for your husband and his health. I will also be praying for you to have the strength you need to help him through. I pray for you and your husband,I pray that the new year brings health and healing.